Sequestration, the Pentagon, and the States offers selected state-level briefs focused on the local impact of looming automatic across-the-board federal spending cuts known as sequestration and historically high levels of Pentagon spending. On March 1, unless Congress acts, billions of dollars will be cut from domestic programs and the Pentagon. But while these cuts will have a devastating impact on many domestic programs, the Pentagon is better positioned to absorb them due to the significant growth in military spending over the past decade. A $50 billion cut in Pentagon spending could fund five years of Community Development Block Grants AND five years of Low Income Home Energy Assistance Program (LIHEAP) AND four years of Homeless Assistance Grants. Military spending has grown by 35 percent since 2002, 48 percent if you include war costs. Domestic discretionary spending grew by only 8 percent over that period. Funding for FEMA’s Emergency Food and Shelter Program has been cut by 53 percent over the last three years. 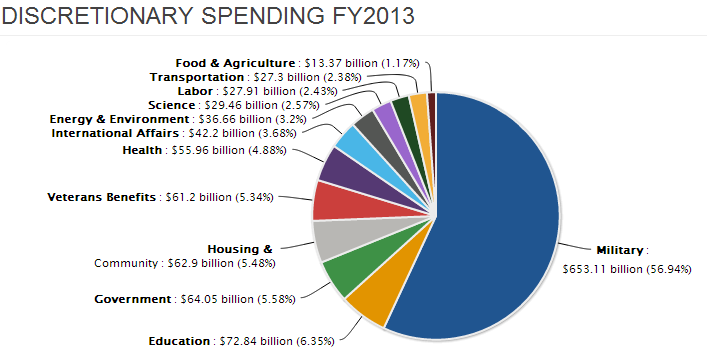 Sequestration would reduce the program’s $100 million FY2013 proposed budget by $5.1 million. At the University of Virginia the Virginia share of total projected Pentagon spending for Fiscal Year 2013, $16 billion, would fund all in-state expenses of a four-year education for each incoming freshman class for the next 46.3 years.